Yesterday we took the second batch of chickens (the slower growing ladies and one giant rooster) to the slaughterhouse. I’m glad I went this time and saw them through the whole process. I have similar conflicted feelings as Andy when it comes to eating meat. Ending lives is sad, no matter what species they are. It was interesting to watch the whole process of live chicken to food. It’s amazing how quickly it all happens. I’ll spare you the bloody details. I like to tell myself that at least these chickens died quickly in a slaughterhouse where the human workers don’t seem to be mistreated or exposed to dangerous conditions. The chickens lived their lives outdoors with fresh grass every day. I’m certainly more excited to eat them than any chicken we could buy in the grocery store. The really hard part of yesterday came after we got the chickens home. First, we cooled them in ice water. We’ve been told that it’s important to cool the meat as quickly as possible. Since we still have almost a week until we cook the chickens, we had to figure out how to keep them fresh and safe for our guests. We talked with people at the slaughterhouse and did some research to find that fresh chicken can be stored safely for a week on ice, as long as it’s kept below 39 degrees. Even though we have two refrigerators, both of them were full when we came home with the chickens, one with mostly pickles and melons. Somehow, though, Andy found space for 19 chickens on ice. We went out and bought some more ice and we’re monitoring the temperature carefully. So far so good. Sometimes I look forward to the end of this whole project, because then there won’t be so much to keep track of and think about. It seems crazy that, without any prior experience cooking for crowds, we’re trying to pull together a meal for more than 90 guests. But I do not regret taking this on, and I’m determined to do enough planning ahead of time so we can simply enjoy ourselves next weekend. As Andy keeps reminding me, it’ll be great. The following post was written by the groom, Andy McLeod. Since camp ended and the cow I’ve been milking went back to Maryland (summer people and their dairy cows, sheesh) I’ve been feeling a little guilty about staying home, not earning any money and not “working,” while Julia goes off work everyday, slaving away in her lakeside office or snorkeling. But I have not been idle (see previous post and add to that cleaning up from all that canning, splitting fire wood and wrangling chickens). J.M. Hatchery told us that Freedom Ranger chickens need 9-11 weeks to grow to slaughter weight, so we scheduled a date with the slaughterhouse for 11 weeks. After about 7 weeks of buying bag after bag of grain, it became apparent that most of the roosters would be ready at least two weeks before our date. 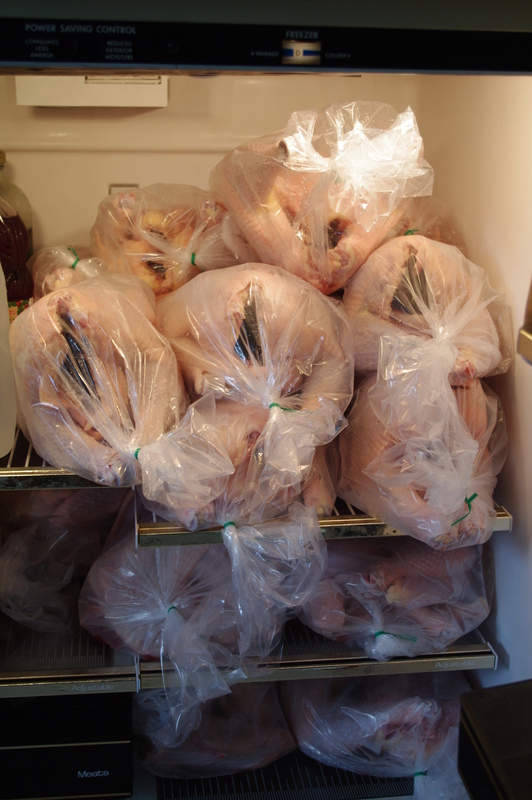 Fortunately, West Gardiner Beef, where Julia’s parents and many other people we know bring their animals to meet their end, was able to fit half of our birds in a couple of weeks earlier. It was a Friday so that left the chore to me alone, since Julia had to go out on the lake to look for invasive plants. Thursday afternoon I started separating the birds into keepers and takers. We have two pens — the smaller one held 13 and the larger one housed 35 birds. Sometimes we let the lucky 13 out to poke around in the woods. We tried to let the 35 out but the door to their pen opens only at the top, so the opening is a few feet off the ground. We propped boards up as ramps inside and outside the pen so they could walk up and then down to freedom. But they wouldn’t do it. One chicken would walk to the top of the inside ramp and stand there looking out — like that kid at the playground who climbs to the top of the slide and freezes in fear while all the other kids are waiting on the ladder yelling at him to just go. And like the kid on the slide, each time, the chicken, well, chickened out and went back down into the pen, forcing all the chickens waiting behind her to climb back down too. The smaller pen’s door opens all the way to the ground, which means they only had to jump six inches over the bottom board. Even that seemed like too much of a barrier at first, but once those first few brave chickens made the leap, the rest followed. So on Thursday I opened the door to the smaller pen, shooed out the smaller hens and one tiny rooster and kept the big guys. That was the easy part. Next, using a borrowed dog crate, I started sorting the birds in the big pen. The first few were easy to catch by just grabbing them by the feet. After a few seconds of being upside down, they went into a kind of trance and just hung there, looking around. But once they knew I was after them, the rest of the chickens ran to the far end of the pen. That meant I had to crawl into the three-foot-high pen, kneeling in chicken poop. They also seemed to know I wanted them by the feet, so they sat way in the corner with their feet tucked safely under their wings. 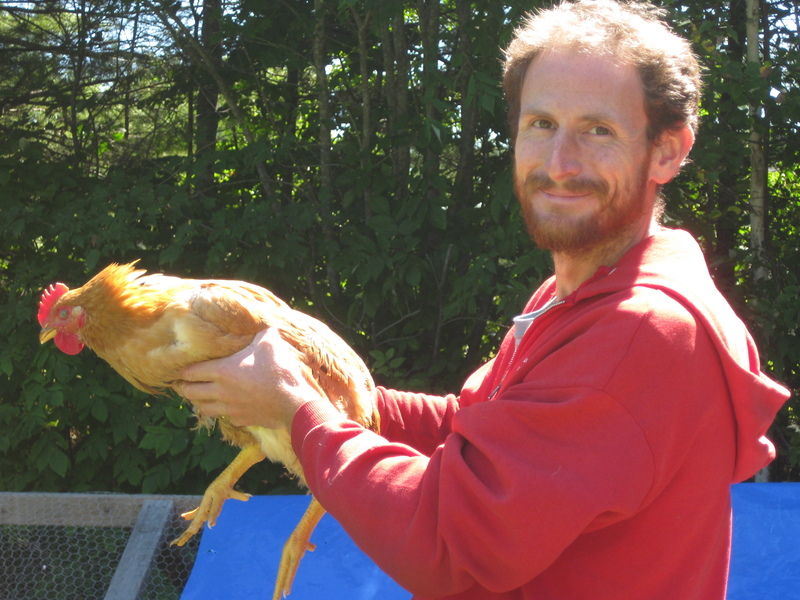 Once I had a crate full of chickens, I then grabbed them by the feet two at a time and carried them to the smaller pen. Once all the big, fat chickens were sorted into the smaller pen for their last night, I then had to catch the smaller hens and rooster and put them in the larger pen. They’re pretty easy to catch. You just walk toward them slowly with your arms out wide and herd them in the direction you want them to go. If you get them pinned against the outside of the pen as you approach, they just hunker down and hope for the best. If you grab them around the body, making sure the wings are tucked under your hands, they don’t squirm much at all. With all the chicken sorting, I was worried about new chickens being picked on by the old flock, but after an initial inspection of newcomers, everyone seemed fine with the new arrangements. 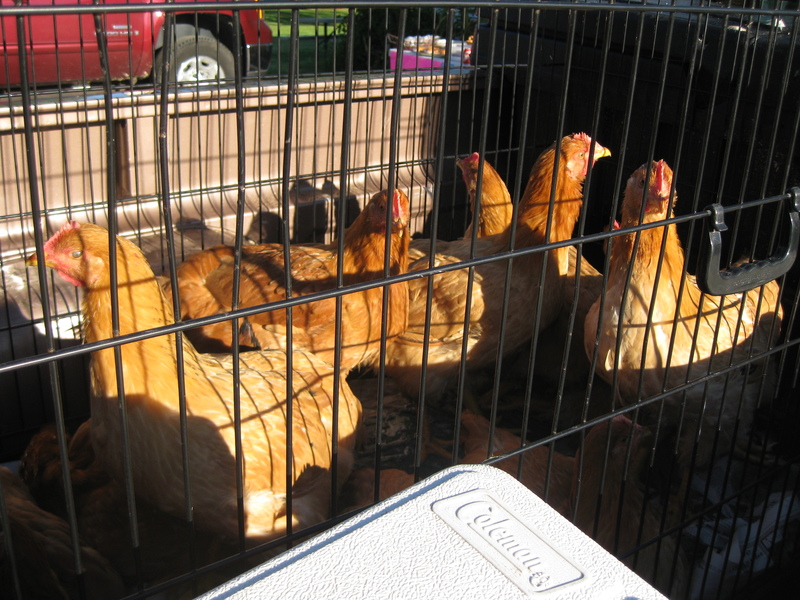 With the sorting done, all I had to do was load the 24 largest chickens into the waiting pet carriers Friday morning. I foolishly gave myself only 15 minutes for this chore. Of course some of the chickens escaped while I was loading others. As I’ve said, they’re easy to catch, but considering my time constraints, I was a bit rushed. Luckily, the extra-large roosters couldn’t run very far before they need a rest. Once I chased them into the woods at the edge of the field, it was just a matter of getting them to trap themselves in a bush or tangle of branches. With everybody loaded up, I was off to the slaughterhouse. It’s a strange and confusing experience to raise animals to eat them. While they were alive, I wanted them to be happy and comfortable and to lead a good life. Up until the last minute, I was concerned about their well-being — trying not to brake or swerve too suddenly with them in the back of the truck and worrying that they were too hot or thirsty on the ride — only to hand them over to blood-splattered butchers to be unceremoniously beheaded, feathered and gutted in a matter of minutes. I am not philosophically opposed to eating meat that has been raised in a humane and environmentally-friendly manner. I think animals play an important role in the small farm model and can provide valuable protein to an otherwise vegetable-based diet. But at the same time I find it emotionally troubling to kill an animal just as it’s reaching full size and maturity. How can I put that much energy into caring for something, not only making sure it is well-fed and healthy, but also that is has fresh air, clean grass and comfortable living quarters, only to eat it in the end? I’ve been considering being vegetarian again. It doesn’t feel right to leave the dirty work to someone else and I don’t think I want to do this often enough that it doesn’t bother me anymore. I don’t want to be numb to the suffering of others, even if they are my dinner. Maybe I’ll get my protein from eggs and milk. I’ve found no difficulty in enlisting the outputs of animals for my own use, and it warms my heart to see a flock of plump laying hens foraging in the bushes.